We work directly with the top manufacturers in order to skip the "middleman". We do not pay sales people any commissions, and we buy our tungsten rings in large quantities. We can't imagine buying rings from a ‘Mall Jeweler’ because of the tremendous overhead and the lower quality. Do you sell light weight tungsten rings? The quality of Tungsten InfinityTM rings is superior to those offered by other generic tungsten jewelers. Most jewelry shops sell everything from earrings to clocks. We specialize in mens rings and wedding bands, so we scrutinize each ring more than most organizations! One way that manufacturers are cutting corners is by adding tiny air bubbles into the tunsten carbide material to reduce the amount of material in the ring and to reduce the cost. WE DO NOT SELL HOLLOW OR AIR EMPREGNATED RINGS! This will eventually lead to polished surface becoming dull. We polish and hand inspect each tungsten ring before it is shipped to guarantee satisfaction. Remember, we are the only online tungsten ring vendor that will replace tungsten rings with no hidden costs or fees (PLEASE NOTE THAT THIS DOES NOT COVER OUR CUSTOM RINGS INLAYED WITH WOOD, METEORITE, ANTLER, MOKUME OR BONE). Please see our Warranty section for more information. The majority of orders ship within 1-2 business days. Some rings do take a little longer (i.e laser engraved rings); so check the detailed information page by clicking on the picture of the ring for processing times for that particular item. *Please note: The processing time is separate from the shipping time. How do I return my ring to get it sized or exchanged? What if I would like to change the style? All returns must include the original invoice. Please see Returns section for more information. Mens Tungsten Online is not responsible for loss or damage of return shipments. Please insure and package carefully! Is there a special way I should ship the ring back to you? While we don’t require any special shipping, we suggest that you insure it for the full value and obtain a tracking number for your protection. Jewelry in shipment is a prime target for theft. Please remember to enclose instructions so we can expedite your return. What is the difference between Comfort-fit and non Comfort-fit? Many wedding bands are available in a comfort-fit style, which means extra metal is used to make the inside of the band slightly domed, resulting in a very comfortable fit. Although comfort-fit wedding bands are more expensive than non comfort-fit bands, we strongly recommend them. The comfort-fit is especially recommended for men, because it is easier to squeeze over a large knuckle when putting your ring on or taking it off, and it's much more comfortable to wear once it's on. Our tungsten rings are comfort fit so therefore in our opinion, we do recommend for you to order a ½ size down. If I have my finger sized at a local jeweler, will your sizes match? Ring sizing is supposed to be universal, but unfortunately, it isn't. Read more about Ring Sizing. Can tungsten rings be sized? No, tungsten rings cannot be sized. Tungsten carbide is too difficult for any jeweler to work with and is virtually impossible to resize. 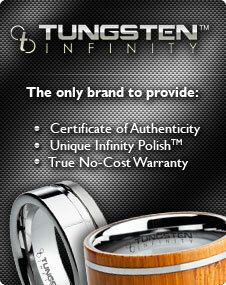 Therefore Mens Tungsten Online is proud to offer Lifetime Ring Sizing Warranty as part of our EASY 1-2-3 WARRANTY. We don’t ever want you to feel like you’re stuck with a tungsten ring that no longer fits. Can tungsten rings be engraved? Yes, tungsten rings can be engraved! Mens Tungsten Online has a special engraving machine that allows us to engrave the inside of our tungsten carbide wedding rings. Typically there is a 15 character limit (including spaces). However, if you require more letters, please give us a call and we will try to accommodate your engraving. Please see Laser Engraving section for more information. Can tungsten rings be removed in case of emergency? Yes, however first we recommend soaking your finger in very cold water and applying a lubricant like hand lotion, petroleum jelly or even window cleaner to see if you are able to slide the tungsten ring off your finger. If you still can not remove the tungsten ring, a vice grip can be used to gently crack the tungsten carbide ring as the metal is brittle and won't bend. All medical facilities remove the rings in this manner. Tungsten rings are actually easier to remove than other metals because they don't have to be cut which can cause serious damage to a swollen finger. Typically, a local jewelry store will size your finger with a finger sizer that looks like a bunch of rings on a keychain. This is a non-comfort fit ring sizer. Our tungsten rings are comfort fit so therefore in our opinion, we do recommend for you to order a ½ size down. What is the quality of the tungsten carbide used in the Tungsten Infinity collection? We take advantage of the highest quality materials available for each piece in our Tungsten InfinityTM collection. Their tungsten carbide rings are 100% cobalt FREE. They use a nickel binder which will not oxidize or discolor. Please beware of generic tungsten that can crack and break. What can I expect with my purchase of a tungsten ring or wedding band from Mens Tungsten Online? You will not only receive the best quality tungsten carbide ring or wedding band on the market but you will receive a free beautiful ring box, free shipping, free laser engraving and a company that stands 100% behind its product. We are happy to offer our Easy 1-2-3 Warranty which includes 1) A 45-day Customer Satisfaction Money Back Guarantee, 2) Lifetime Ring Replacement and 3) Lifetime Ring Size Warranty. Please note that the lifetime ring replacement and warranty do not cover custom rings that are inlayed with meteorite, wood, mokume, antler, dinosaur bone, etc. Please see our Warranty section for more information. How can I contact Mens Tungsten Online? What forms of payment does Mens Tungsten Online accept? We accept Visa, MasterCard, American Express, Paypal, e-check and personal check.